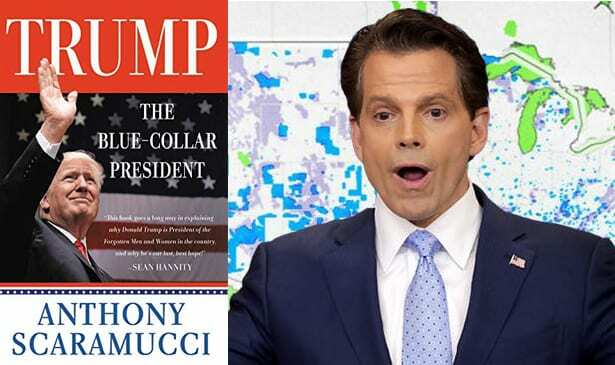 NASHVILLE, TN — The book is “Trump, the Blue-Collar President.” The author is Anthony “The Mooch” Scaramucci, financier, entrepreneur and political figure. His just-released new book tells the inside story of how Donald J. Trump, a billionaire living on Fifth Avenue, zeroed in on the struggle of blue-collar Americans, and won the Presidency, therein lies the origin of the book’s title. Mr. Scaramucci served as White House Communications Director for an entire 11 days and was fired. It wasn’t exactly an experience he was prepared for. “I got a Ph.D. in Washington, DC and what these people are really like in 11 short days and let me tell you something, they’re way worse than the American people think they are,” he tells the Tribune in part two of this interview. Even though his tenure was brief, “The Mooch” moniker became a household name and a media darling, especially as a guest for the late-night talk show guys. In his book, Anthony tells the tales of many behind-the-scenes, eyebrow-raising situations as Communications Director at 1600 Pennsylvania Ave NW, Washington, DC 20500. He holds nothing back and spares no one’s feelings-including those of the country’s most powerful people. But he also shares anecdotes about his 30-year relationship with President Trump, which goes all the way back to their early interactions in the New York City social scene. Like so many who have become a part of the list of “all the president’s men,” Scaramucci has also found fame, a book deal, and even more fortune. He is the founder and co-managing partner of SkyBridge Capital, a global alternative investments firm he founded in 2005. According to Business Insider, it was recently announced that by the end of this year, plans are to launch an Opportunity Zone (OZ) fund. The hedge fund firm is seeking to raise up to $3 billion from investors and will be set up as a real estate investment trust. TRIBUNE: Should people who are not President Trump supporters read this book? And if so, why? 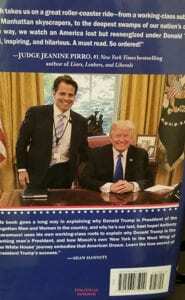 Mr. Scaramucci: Well, you know, I tried to write an all-party, all season book. If you’re not a supporter of Donald Trump, and you don’t like his agenda, then you’re mad at me for titling it ‘Blue Collar President’ because he was born with a golden toilet seat. You should still read the book anyway because I’m explaining what he did. Donald Trump literally lifted the base of the Democratic Party, the core constituents of blue-collar labor, blue-collar working class and middle-class people. He lifted them and moved them over to the Republican ledger. And so, this is a historic achievement by any politician. I take people through the steps of how he did it and how he was capable of doing it. And what was unique about his personality that allowed him to see that and allowed him to relate to those people, despite the wealth he was born into and then the subsequent success that he had. So, if you don’t like Donald Trump and you want to figure out how to beat him, you should read my book. But if you do like him and you want to see him stay in office, you should read it as well, because there’s a very fundamental thing that he’s doing. I think it would be really much better off for the entire country if both political parties focused on those people and we worked on ways to improve their living standards and give them a living and rising wage. TRIBUNE: Do you think people have misconceptions about Mr. Trump? Mr. Scaramucci: Well, it’s sort of what the Tree of Life Rabbi (Jeffrey Myers) said after the tragic synagogue shooting in Pittsburgh. He said that he’s (President Trump) is a little bit more compassionate, a lot more gregarious and caring than he comes across on television or from those live sound stages where he’s doing his rallies. He’s less combative than perhaps he would be in one of those presidential debates, or in some of the speeches that he’s making. At the end of the day, he’s got good kids for a reason. He’s a caring guy and he’s got a lot of friends that genuinely like him. There are some things that he’s doing, I’m not in love with. I can be very honest about that as well. I like calling balls and strikes. I think he could dial down some of the rhetoric, and probably curb and be a little bit more strategic on Twitter. So, I mean, look, none of us are perfect. I certainly write in my book about a lot of my personal flaws and my shortcomings and certainly the mistakes that I made inside the White House that caused my tenure to be so short. So, I am not here, throwing eggs and tomatoes at anybody as much as I’m being reflective and observational. TRIBUNE: Do you think Mr. Trump is more of a politician, more of an entertainer or a little bit of both? Mr. Scaramucci: Well, no, he’s clearly an entertainer first. There’s no question about that. I’ll tell you a quick funny story. We were descending into Youngstown, Ohio on Air Force One. We had ordered the Italian wedding soup on the Air Force One menu. I was eating mine, he (Mr. Trump) stopped eating after two or three scoops of the soup. I looked at him and said, ‘Why aren’t you eating it?’ He said, ‘I learned from Frank Sinatra that you don’t fill up your belly before a stage performance.’ And I said, ‘Well, why is that?’ And he said, ‘Well, you know, you don’t want to be driving all the blood sugar down to your digestion. You want to have it up in your brain.’ So, I thought that was very compelling, but it really spoke to him thinking of himself as an entertainer the way Frank Sinatra was. And when you think about it, he’s (Trump) is able to command people to a stage, and indoor and outdoor arenas, without a musical instrument or a singing voice. So, whether you like him, or you disliked him, he’s a compelling guy. He’s someone that people gravitate to and will listen to. And two years after his presidential run he’s still packing stadiums, arenas, and civic centers. TRIBUNE: Many African Americans, Hispanics, and other minorities feel that Mr. Trump has policies and views that are not in their best interest. Your thoughts on this. Mr. Scaramucci: Well, listen, I mean, I understand that some of the coarseness of the rhetoric and obviously the very heavy hitting in the press between the President and the mainstream media will lead a lot of people down that road. But you know, there are guys like Jim Brown, the legendary NFL player from my hometown, who’s very supportive of the President because they see his policies helping inner city youth and see his policies cutting the slack in the labor markets where both Hispanic American and African American unemployment numbers are at historic lows. And so, there are positives there. TRIBUNE: A lot of people believe the President is racist. Do you? SCARAMUCCI: I don’t think the President is racist, but I do understand that he needs to be more aspirational. If he does that, his polling numbers, if you look at them, they’re better than most Republican presidents as it relates to the African American and Hispanic American voters. But he can do way better than that if he becomes more aspirational. So, I’m hopeful of that. TRIBUNE: Since you’ve known the President personally for about 30 years, does it bother him that people think that he’s racist? Mr. Scaramucci: Yes, I think it does. I think there’s a dirty little secret that we all share. I learned this frankly from Valerie Jarrett, who was President Obama’s Director of Office of Public Engagement. She once said to me that all of us, when we’re being viciously attacked in the media, we try to keep a stiff upper lip and we try to act like we have a thick skin. But I think it bothers him. I don’t think anybody is 100 percent immune to that sort of vicious attack or those vicious accusations. So yes, I think it does bother him. I think he’s expressed a lot of frustration about that by the way. You know, I think he has a thick skin and I think he’s tough enough to handle it. But I think there’s a lot of hatred out there on both sides that we really should try to dial down. Next week the conversation continues with Anthony Scaramucci, as he answers questions such as: What is his relationship like these days with the President after being fired? And his comments about marijuana becoming legal nationwide now that the mid-term elections are over. TRIBUNE: The President has made several public comments that have been quite controversial. Many are saying that some of his statements are rooted in a form of hate speech. Your thoughts? Mr. Scaramucci: Again, you have to remember what we’re doing in our society now. If we disagree with somebody’s policies, it’s not enough to have an intellectual debate. What we have to do is to fully demonize and effectively de-humanize that person. And so, the Republicans are doing that to the Democrats. Many people sort of did it to President Obama. And the Democrats are currently doing it to President Trump. But if you are asking me should he dial down some of the courses of his rhetoric? I absolutely believe he should. I think there’s a five to seven percent headwind in his face from some of the rancor in and around him and he’s the leader of the free world. I would experiment and take a step forward to see if he could de-escalate some of the tension between him and the mainstream media and others and then see how that works for him. I would predict if he does that, given how strong the economy is, and how well so many things in the U.S. are doing right now, I think he would do better. I would recommend him to do that. We just looked at the economic dashboard, it’s very positive. So, I don’t think it’s hate speech as much as I think it’s a retribution for what he sees is a lot of negative attacks on him. TRIBUNE: I read a statement that you’re predicting President Trump will approve legalizing marijuana after the mid-term elections. Comments? Mr. Scaramucci: The President is not a drug user. He’s not a fan of drugs at all. He told his kids that he’ll pay for everything, but they can’t use drugs or alcohol. And he once said to me and others privately and probably publicly as well, ‘Stay away from this stuff, cause you’ll be at a much bigger advantage.’ He said, ‘I know so many smart people that were in school with me that got hooked into drugs and or alcohol, and they lost their way as a result of those addictions.’ And this is coming from the President. But I believe that he thinks that the train has left the station on cannabis… I think he sees it as a potential revenue source for the government, both for state local and the federal government. I think what’s also happening now is that because there’s a mix and match between the states that have legalized it and those that haven’t, it’s affecting the banking system in sort of a weird way as well. So, my guess is it will get federal approval, and the President will support it. When you’re thinking about the generation of Americans that are coming of age that both parties are trying to attract, I think it’s popular with them as well. So, my guess is it that legalizing it goes in the category of alcohol. It’ll be regulated, taxed and available for recreational use. I’m predicting this will happen for the 2020 presidential re-election. TRIBUNE: If it does become legalized, will you celebrate? Mr. Scaramucci: Well, I’m not a fan of it (marijuana) personally. I’m certainly worried about the younger people though. I’ve got four sons and a daughter, you know. There are studies that say using pot below the age of 25 does certain disruptive mechanisms to cognition. I’ve never smoked it myself. But being a political realist, I have accepted that there’s a very large group of people that see the benefits of it, especially the medicinal benefits of it and doing the recreational benefits. As I do write in my book, my family, unfortunately, has a genetic predisposition for addiction-related illnesses. So that could be biasing me and why I’m expressing a little bit of fearfulness in and around the various sorts of mind-altering drugs. Even though I’m not a huge fan of it, I understand practically why it’s going to get legalized. TRIBUNE: If Mr. Trump becomes president 46 and asks you to take another job at the White House, would you accept? Mr. Scaramucci: My wife would tell you something different than what I’m about to say. My wife would say, ‘don’t listen to Anthony, that’s a bunch of BS. If they ask him to go back, he’s going back on the day that they asked him.’ But the truth of the matter is, I’ve made a commitment to my employees and I have to put my family back together. We were in a rough spot a year and a half ago. But we’ve been able to put our family back together and my company is doing super well. I think it’s a lot tougher to go back as a result of the commitments that I have now. But listen, I was honored to serve. I miss Washington and I miss some of the people that were on the President’s team. I thought we were collaborating with each other. I didn’t realize we were competitors to each other. When they started their shenanigans on me, I didn’t fully understand it. Frankly, I was too politically naive to understand what they were doing. But once I figured it out, I then made the age-old classic mistake of putting my pride and ego into the game. I went after those guys with a vengeance, and eventually, I lost my White House job. I probably shouldn’t have started that job with a chainsaw in my hand and a hockey mask. That was wrong of me. TRIBUNE: What is your relationship like with Mr. Trump nowadays? Mr. Scaramucci: I’d say it’s pretty good. I talked to him just last Sunday after my appearance on Bill Maher’s show (Real Time With Bill Maher). Trump was being the media coaching chief. He called me to grade my performance on the show. We were having a good laugh about the interview while discussing Bill’s show. I’m back to being a friend of the President…I’m far from loyal. But I don’t want to lose my friendship with the President because of a mistake that I made inside the White House. And then having John Kelly move aggressively to fire me or kick me off the White House campus. I’m not going to lose friendship over something like that. I think that’s silly. And the other thing I try to tell people in my book is there’s no whining in sports or politics. I lost that one. I dusted myself off and got back in the game. There’s no need to whine about it. There are other fights to be had and there’ll be other successes down the road. You can’t win every battle. TRIBUNE: What grade did he give you on the Bill Maher interview? TRIBUNE: Would you ever run for a political office? Mr. Scaramucci: No! I’m not going to subject my family members and my wife to that kind of a brutality. I love this country. I certainly expressed a willingness to serve, but these are very diabolical people. There would have to be a massive sea change in the body politic where the American voters would really have to get fed up with the nonsense that spins the absurdity of all these political consultants and the constant rain of negative advertising. I mean, the way the Democrats paint the Republicans is nauseating but equally nauseating is how the Republicans paint the Democrats too. I find the whole thing disgusting. I wouldn’t want to stoop to that level if that’s what is needed in order to win an election.